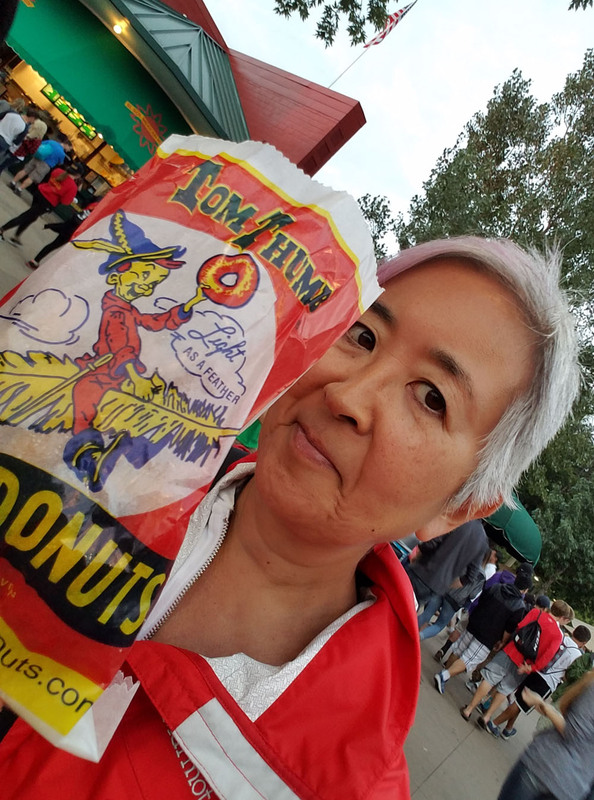 While my arteries recover from all the deep-fried foods I ate at the Minnesota State Fair, I’ll tell you about my adventures in the Twin Cities the past several days! 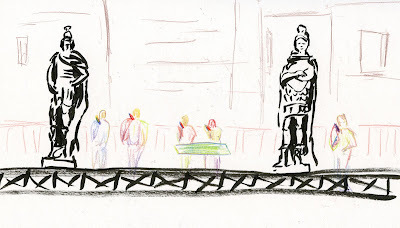 Before I get to the bulk of my fair sketches, however, I thought I’d follow up on my post from last week that was prompted by a reader’s question about how I sketch while traveling with my spouse. As you learned from that post, Greg and I have a system that works well for our independent interests. When I’m with other non-sketchers, though, I don’t want to keep them waiting, but of course I always want to sketch anyway. How do I manage that? 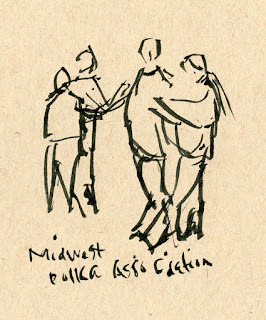 Our trip to the Twin Cities, with the primary purpose of visiting with family, was filled with examples of how I’ve learned to balance my own desire to sketch with socializing as a group participant. 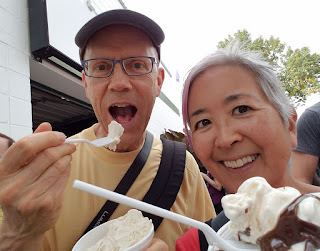 Our first full day in the Cities was spent with three family members at the famous Minnesota State Fair, one of the largest and best fairs in the country. 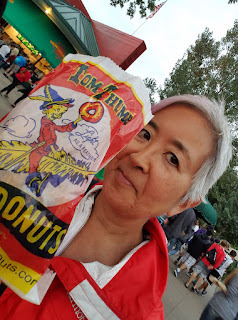 It helped to know that I would be back again the next day, so I used that first day as a “teaser” to survey all that the fair had to offer and set priorities for my focus later. 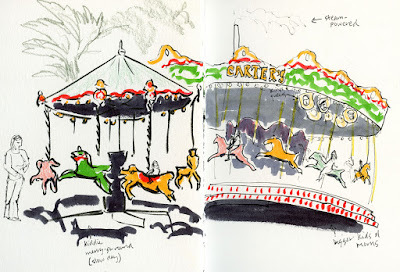 Still, I hadn’t been to this fair in nearly a decade, and I’d never been there with a sketchbook, so it was impossible to resist sneaking in a few sketches. How? I was always on the lookout for moments (and I mean literally moments of one to five minutes) when the others were occupied. My sisters-in-law want foot-long corn dogs? 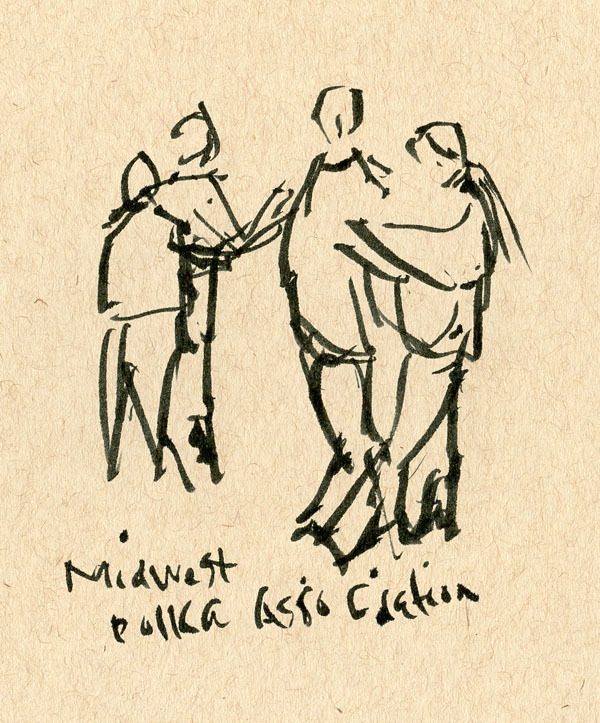 Plenty of time to sketch polka dancers. Others are still in the restroom? 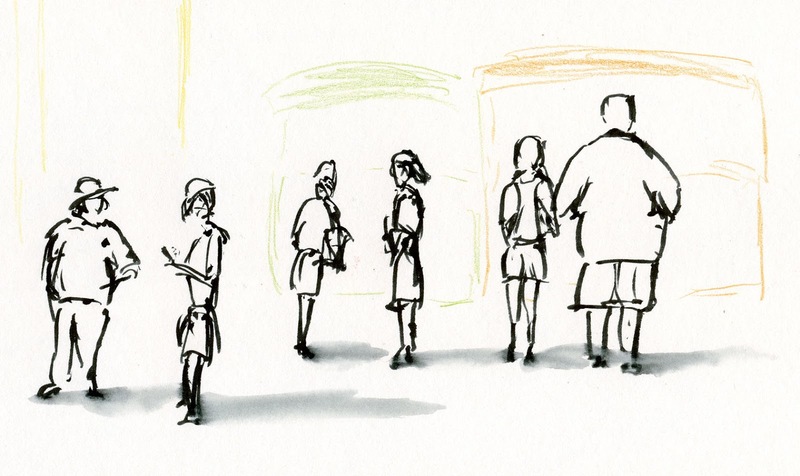 A quick sketch showing the variety of sizes and stances of fair-goers. 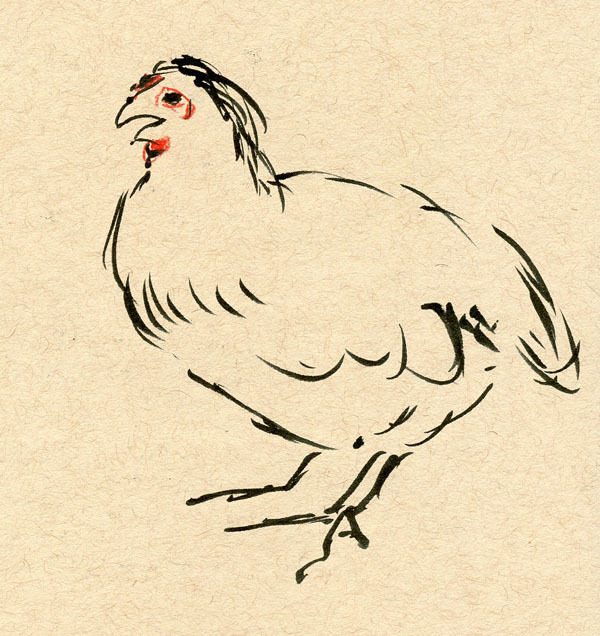 Strolling through the poultry barn? That’s easy – I just focus on one hen while the others go down the aisle, and I catch up with them a few minutes later. 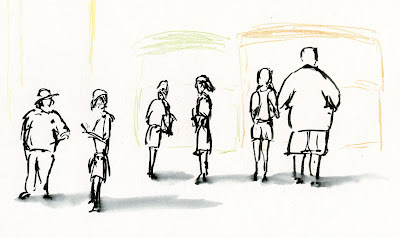 And while the rest of the group goes through a fair history exhibit at a leisurely pace, I go through quickly, then wait outside the exhibit hall to capture more activities in my sketchbook. It’s a matter of choosing subject matter appropriately – perhaps a single object rather than a scene – making it small, and adjusting expectations to the time available. And sketching fast! I usually use a brush pen for quick gestures, no details and colored pencil scribbles. 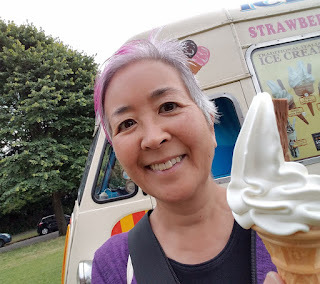 I even had plenty of time to scarf down foods on sticks, just like everyone else! For the record, the best thing I ate was the deep-fried pumpkin pie served with vanilla ice cream – to die for! Healthiest and a runner-up for best taste was the roasted corn on the cob dipped in butter. 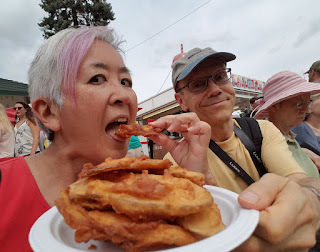 Most surprisingly tasty was the deep-fried pickles! I could have passed on the Australian battered potato, although smothering it in sour cream and sweet chili sauce certainly helped. What’s Australian about it? asked a Facebook friend. The answer: the booth was playing “Waltzing Matilda,” and a tiny Aussie flag pierced the top of my potato. Meh! 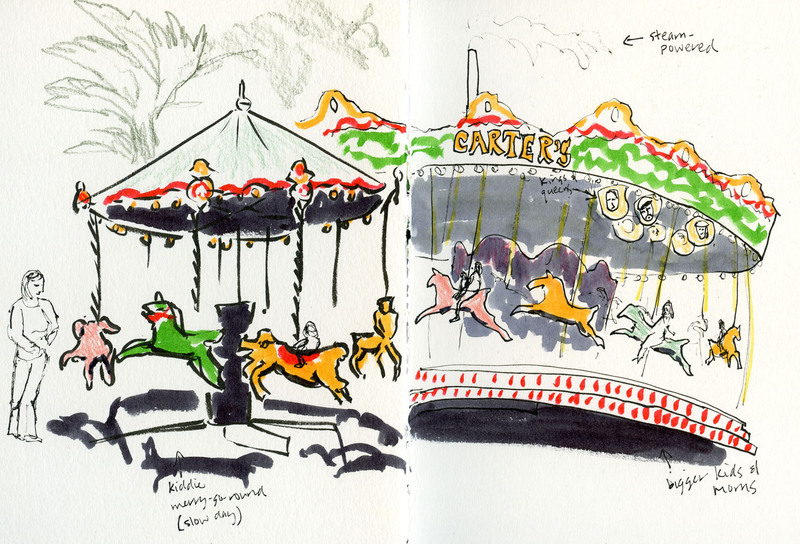 Stay tuned for the rest of my state fair sketches! 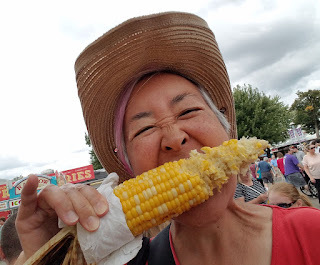 The healthiest thing I consumed all day: roasted corn on the cob! Last week on a morning sketchabout, I spotted a cute Vespa in the ‘hood. 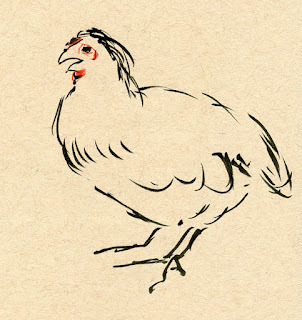 I sketched it in my red Field Notes. 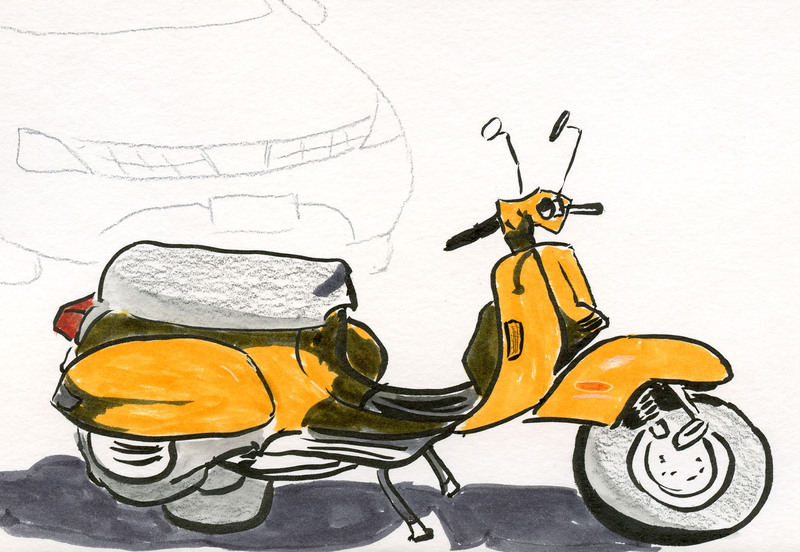 Even on a full-page spread (which, granted, is only 5 ½ by 7 inches), I managed to run out of space for the front wheel. The very next day, driving through the Green Lake neighborhood, I spotted an orange Stella scooter. I pulled over immediately to sketch it, this time in my Stillman & Birn. I don’t know why, but I started drawing the rearview mirrors near the middle of the page – so I nearly ran out of space again when I got to the wheels! It’s one of my ongoing sketching challenges – I don’t always plan the composition carefully on the page. 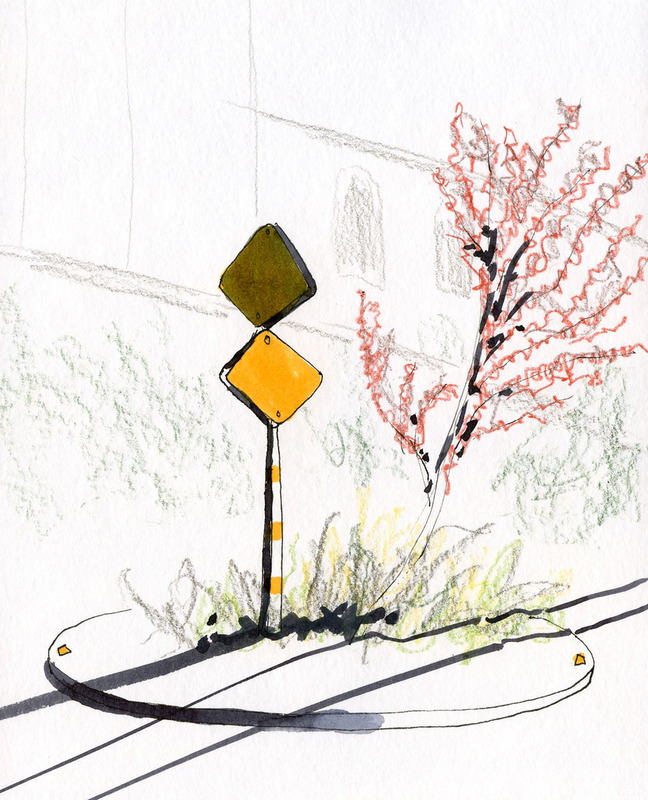 A couple weeks ago when I first started noticing that the trees are starting to turn, I spotted this one in a traffic circle and wondered if it had already turned completely – but on closer inspection, I saw that it was dead. A block north of the one I sketched the other day, it was apparently hit by a careless driver who ran right over the circle. The plants at the tree’s base are crushed and also dead. Someday the tree will probably fall over. 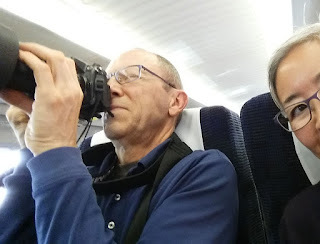 Greg doing his thing in a train in Japan. 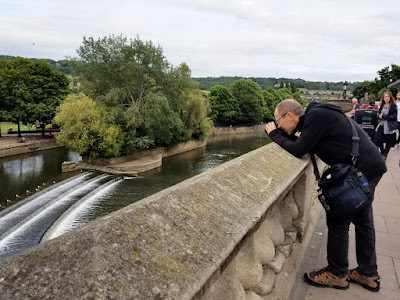 After seeing my posts about our travels in the UK, a reader asked me what my husband Greg is doing all that time that I’m sketching. That’s a question that I get asked frequently by friends who know how much I love to sketch and how much we both love to travel. Specifically, Jean is interested because she’s planning to attend the USk symposium next year and wondered how to manage such a trip with a non-sketching spouse. “How and when do you meet up with your spouse during the Symposium? What parts of the Symposium can your non-registered, non-sketching spouse attend and not attend? How is your spouse received by other sketchers? And how do you plan a trip that pleases both of you, so he isn't just wafting about waiting for you to be finished with the Symposium so you can move on to the rest of the trip?” All great questions, Jean! The easy and short answer is that Greg is a photographer, so our interests are highly compatible. 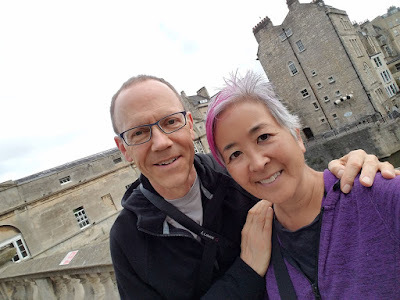 Although certainly we enjoy spending time together while traveling, we also want to go our separate ways and meet later at a designated time and place. “Done, where u?” is a text message we exchange frequently. If he didn’t have photography as a hobby, it might be more difficult to manage traveling together so that I still have time for myself to sketch. But I’ve also traveled or day-toured quite a bit with non-sketching friends and family members and have still managed to get in sketching time without being annoying (at least, no one has told me I am ☺). 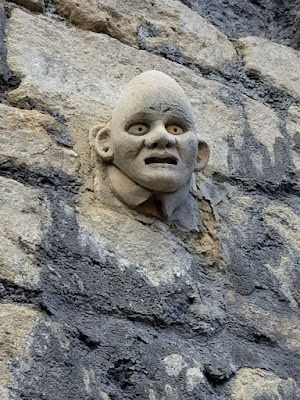 Greg doing his thing in Bath. There’s a reason for that: I can be very fast. If there’s one thing I’ve learned from sketching on location regularly, it’s the ability to manage my sketches based on how much time is available to me. (My correspondent role in Manchester certainly helped me hone that skill.) I wouldn’t want to make people wait 30 to 60 minutes for me to do a typical sketch. But no one seems to mind waiting 10 minutes, and often they welcome the opportunity to sit on a bench and rest while I do a quick one. If I know I have only 10 minutes, then 10 minutes is all I need. 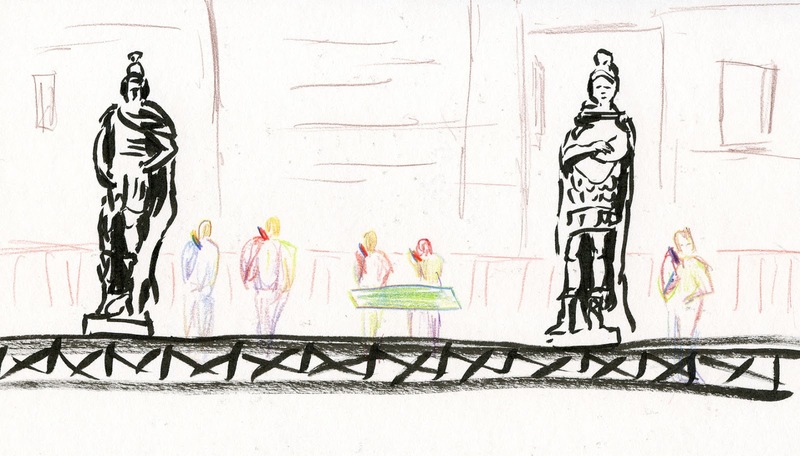 Attending the symposium with a non-sketching partner need not be an issue, either. 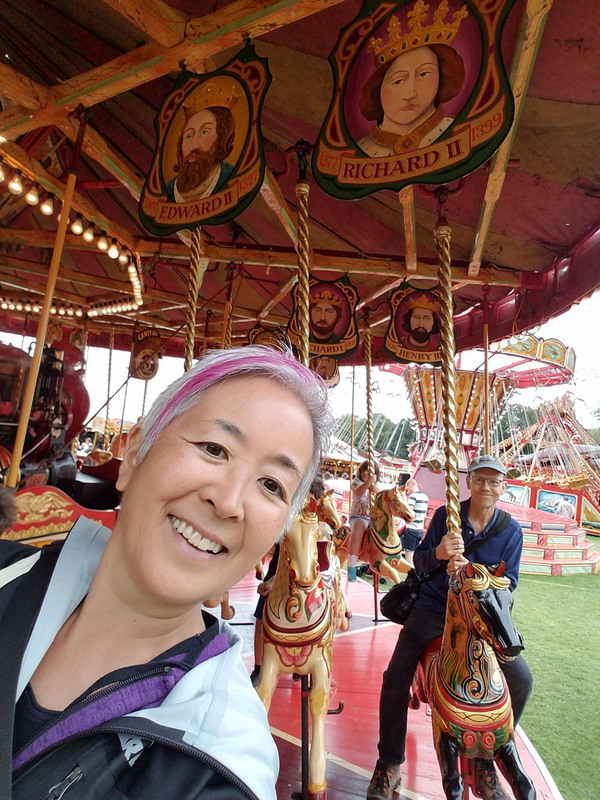 I talk to other symposium participants who are traveling with partners and keep my ears open. 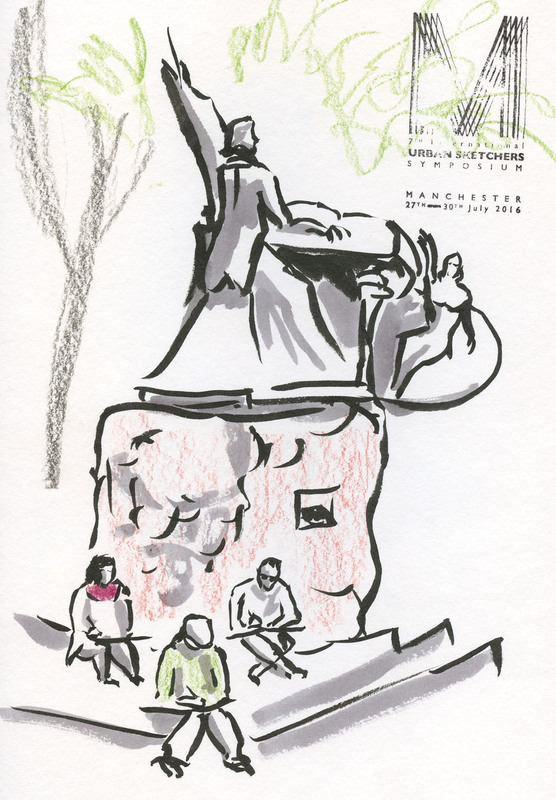 During the Barcelona symposium, Greg met another sketcher’s husband, and the two of them decided to do some touring together one day. (I regret to this day that I missed out on a visit to Parc Güell, but I had workshops to attend!) A similar opportunity came up in Manchester, so I let Greg know about it. In Paraty, a small town that’s easy to navigate, I always left him a copy of my workshop map and timetable so that he would know where I would be each day, and we sometimes met up for lunch between workshops. In Manchester he joined me for lunch at the Manchester Museum where I had just done some sketch reportage, and afterwards he enjoyed the exhibits while I moved on to the next event. Greg doing his thing in Rio de Janeiro. 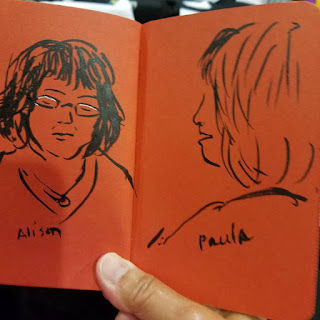 At all the symposiums, Greg joined me at dinners and drink-and-draws with other sketchers, who enjoyed having another “victim” to draw (Greg got used to appearing in lots of sketchbooks!). And sometimes I skipped social events because after a long day of non-stop activities, it was nice to have a quiet dinner for just the two of us. In regard to Jean’s specific questions about which activities spouses might be allowed to participate in, that’s something that has improved over time. In Barcelona, a number of spouses wanted to attend the closing reception, but there was no formal process in place for them, which led to people feeling like they had to sneak in the back door. In Manchester, however, the symposium staff anticipated this issue and simply sold reception tickets at the door to cover refreshments. 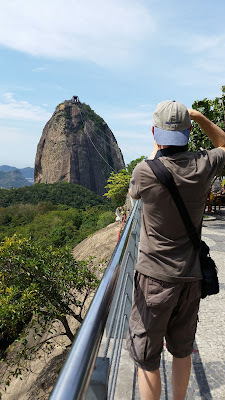 In Paraty, which didn’t sell out and therefore had attendee passes to spare, I bought Greg a low-cost “Sketcher” level pass, which allowed him access to the central facility where attendees hung out between workshops, used the restrooms, grabbed a snack and used Wi-Fi. That pass also allowed him to attend the receptions. 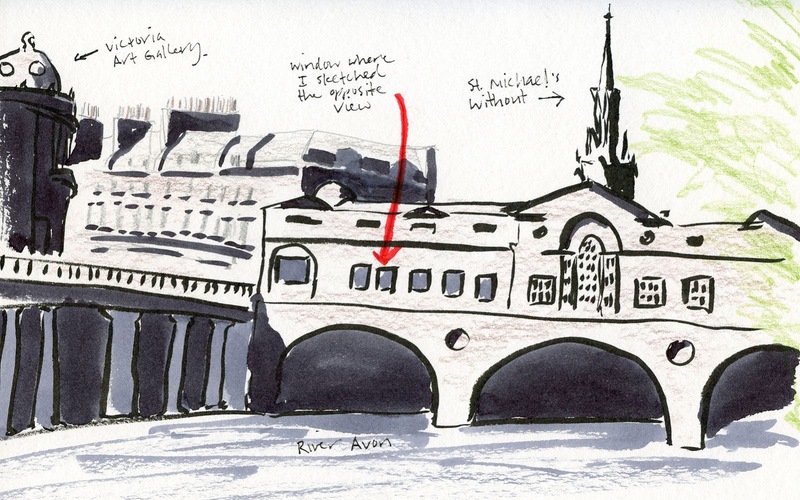 Achieving the right sketcher/non-sketcher balance during travel is not as easy as when you and your partner are always together. But having separate experiences gives each of you a different perspective and often enhances the travel experience as a whole. And balance is the operative word – just like all the other parts of a relationship. 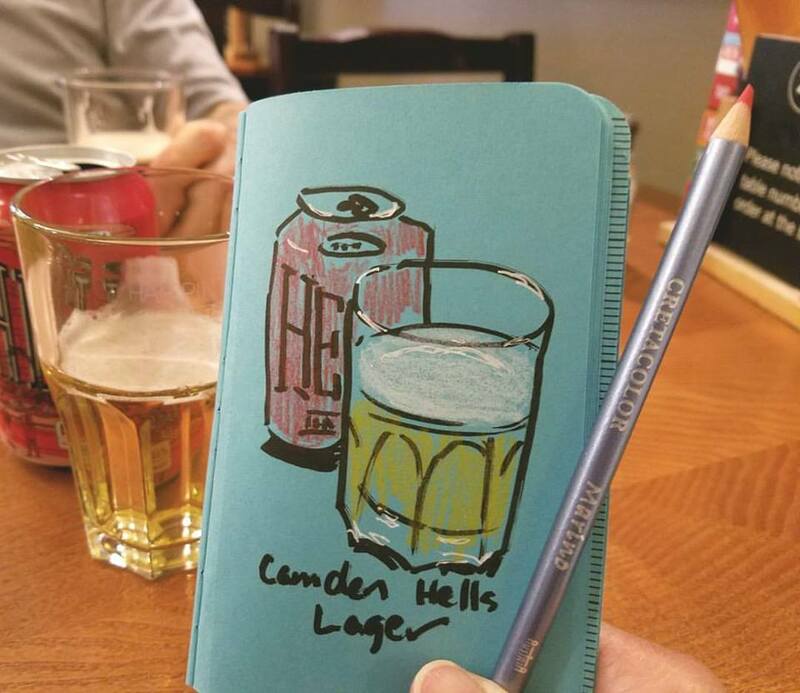 If you have a non-sketching partner, what kinds of things do you do to achieve balance during travel? 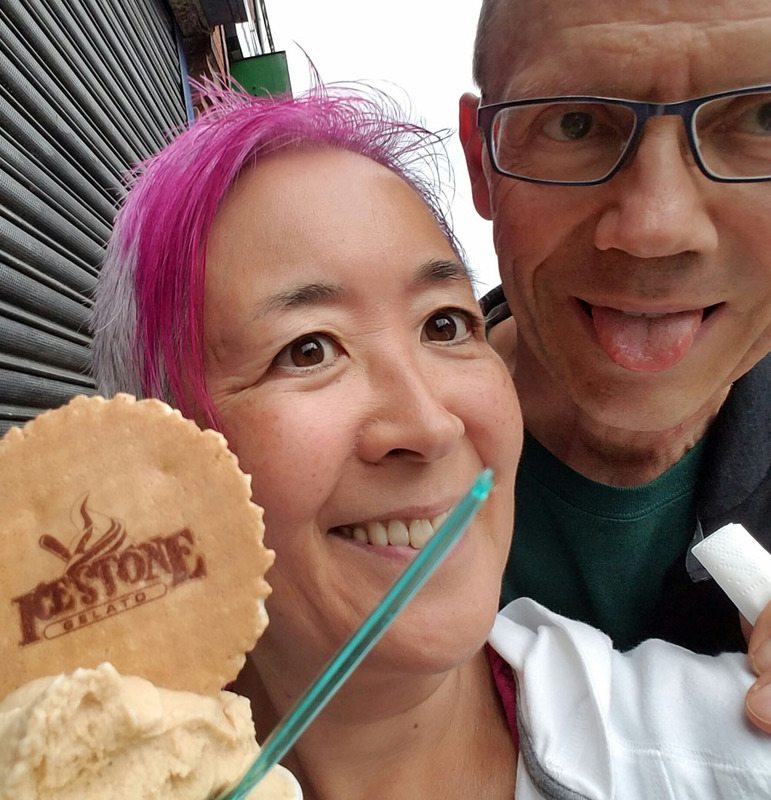 Like Jean, if you’re thinking of attending a symposium for the first time, you might want to check out the post I wrote after Barcelona. After that first symposium, I learned a lot of practical matters as well as how to manage expectations. We always eat ice cream together! Ever since I got back from the UK, I’ve been seeing trees all over town that are starting to show hints of turning. They’re all still mostly green, yet leaves near the top are definitely going yellow-orange. 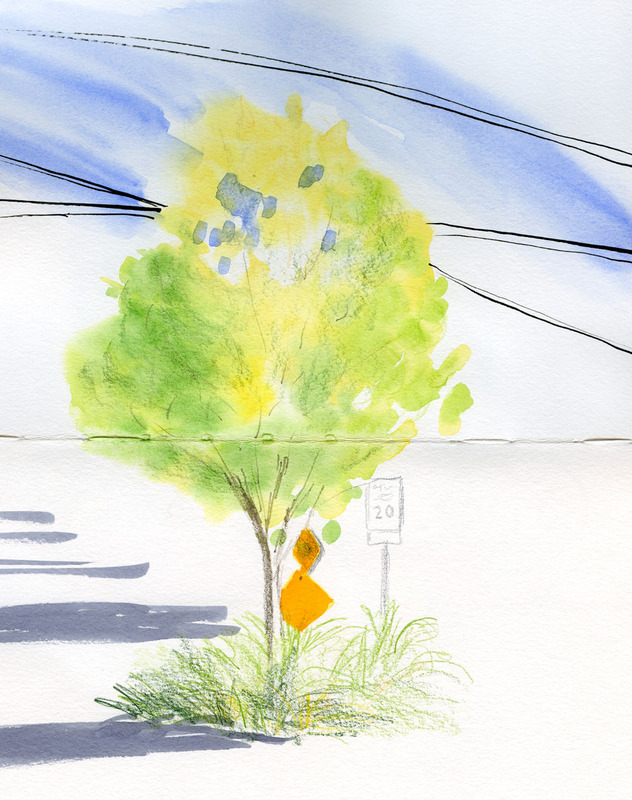 I sketch this aspen a few blocks from my house every fall, and I know that in a few weeks it will be completely gold. Today it’s still got a lot of green left, but I was surprised to see how quickly it’s changing. I daresay fall is coming. 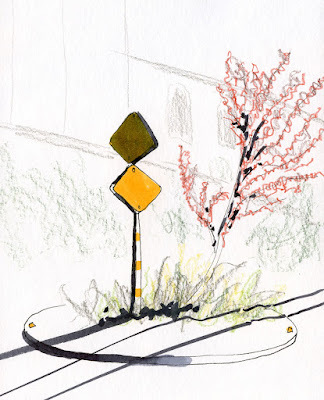 Technical note: Normally I would start a sketch like this with ink to give me some guidelines – the base of the traffic circle, the caution sign, the tree trunk and the general shape of the tree. This morning, on a whim, I decided to paint the tree first. Then I went in afterwards with colored pencils to draw the trunk, lower plants and other details. I like the effect of having fewer guidelines. What do you think? For the past couple years I’ve been telling the story about the utility pole in front of our house that needed to be replaced. It started two years ago, when workers came to install the new pole but left the old one in place. Six months later, workers returned to do some repair work. Finally in January this year, I thought I’d seen the last of them when they came to chainsaw the old pole down, though they left about half of it still standing. It turns out that the saga wasn’t over. A day or two before we left for the UK last month, workers returned yet again, this time to fully extract the remains of the old pole from the ground. I saw how fast they worked when they removed the pole standing in front of the house a few doors down, so I knew I wouldn’t have much time. 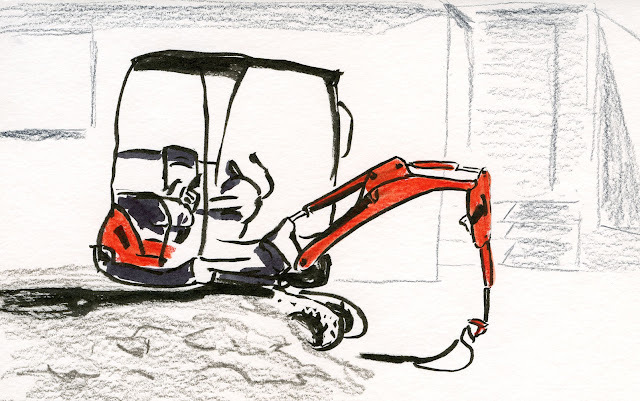 I was still sketching the crane operator when the pole came out – yanked right up out of the ground like a rotten tooth! A second worker filled the hole that the pole had left behind. 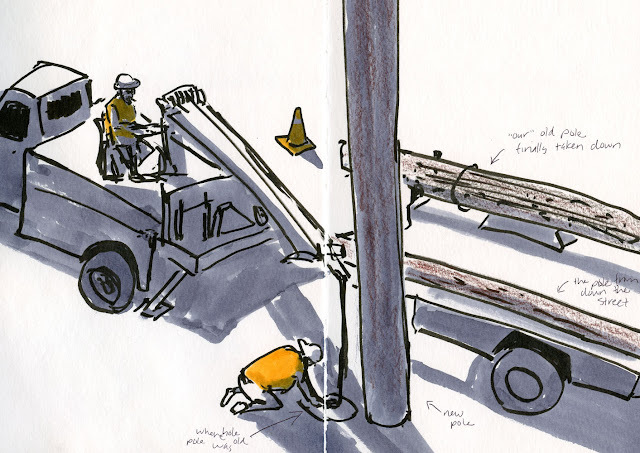 By the time I got to sketch “our” old pole, it was already lying in the truck’s bed right next to the one they pulled from down the street. Maybe this time the story finally concludes! That headline isn’t really metaphorical. We’re having a heatwave this weekend in Northwest Washington that warrants an “excessive heat warning,” according to the National Weather Service. But that didn’t stop well over a hundred sketchers from showing up for the Fourth Annual West Coast Urban Sketchers Sketch Crawl in Tacoma! Festivities began Friday night at the opening reception, which included a portrait party (a few minutes to sketch someone you don’t know, then move on to another person). The highlight of the evening was, of course, the huge door prize giveaway of literally hundreds of dollars’ worth of gifts from generous art supply stores and other vendors. Many thanks and kudos to Frances Buckmaster and the Tacoma team for procuring a gold mine of donations! I don’t know which city will be hosting next year’s WC sketch crawl, but I’d say they have a pretty high bar to meet! 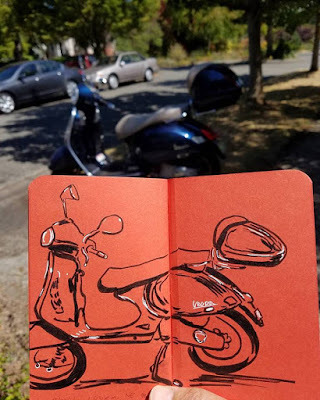 The weekend’s main event was an all-day sketch crawl Saturday and a half-day on Sunday around Tacoma’s highly sketchable museum district. Although the event didn’t officially begin until 9 a.m. Saturday, I was already on the sidewalk by 7:30 a.m. to get ahead of the heat. 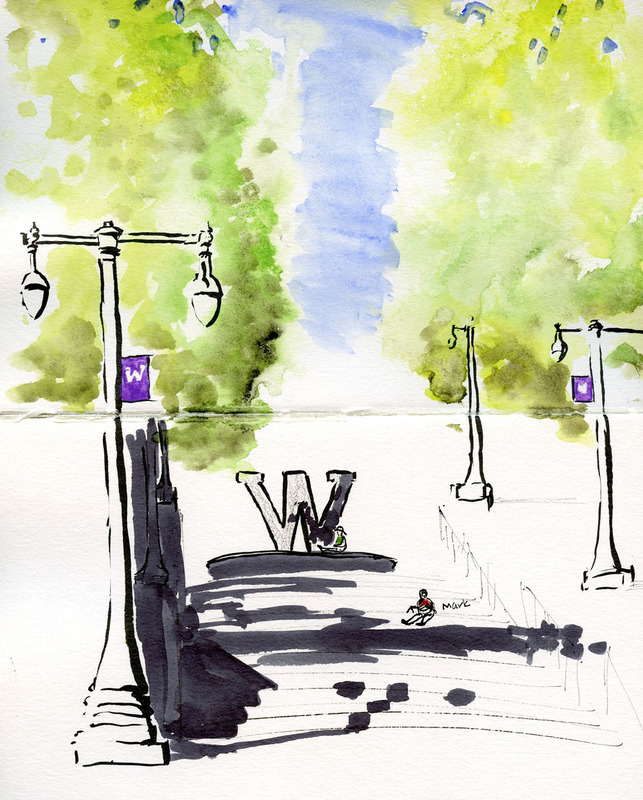 By mid-day, I had captured two sketches in the still-comfortable shade – one of the majestically domed Union Station building (which I sketched about a year ago from a different angle) and the second of the University of Washington’s Tacoma campus stairway. 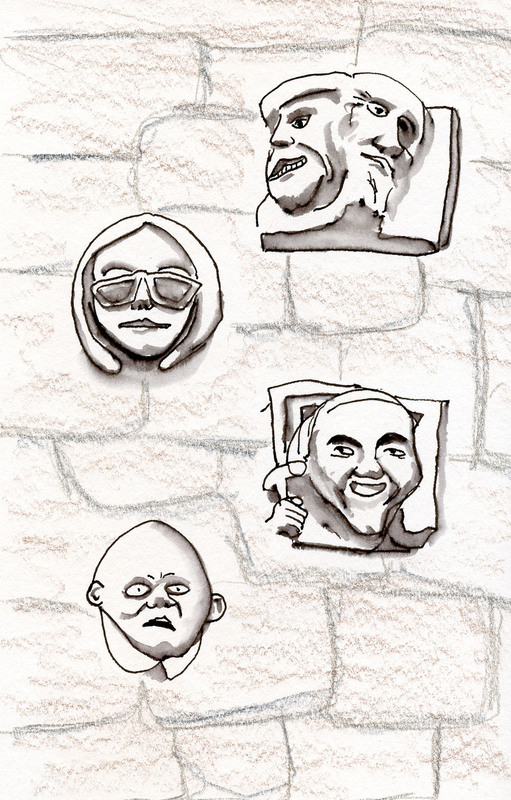 I don’t know if anyone officially counted heads, but here’s the photo of the Saturday mid-day sketchbook sharing! As a “cool down” from all the sketching of amazing architecture and scenery I enjoyed in the UK, I’ve been taking casual sketch-abouts in my own neighborhood since I returned. 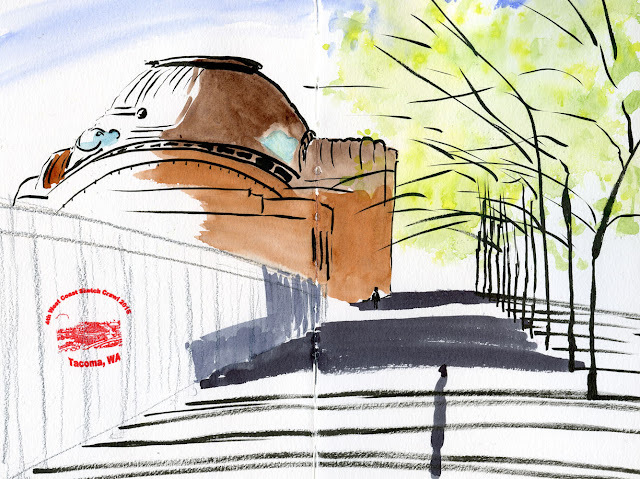 No matter how much I enjoy the challenge of sketching exotic sites, I have just as much fun sketching the mundane on my own block. Like all the diggers that seem to be appearing suddenly! 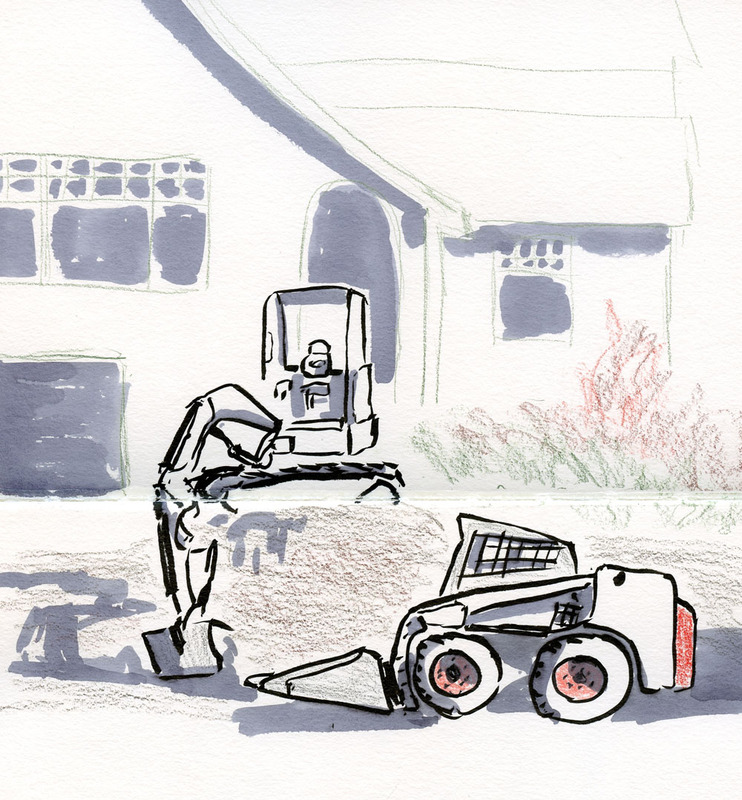 One day I was walking on Northeast 80th, and I spotted two of them in one yard, sitting near the piles of dirt they were apparently digging. A couple days later on Northeast 84th I spotted another one doing the same thing. In both cases, they were idle, waiting for the next thing to do. As a prior “victim” of lengthy home-improvement projects, I sympathized with the owners, who are probably eager to get on with their projects. Nina Johanssen's workshop students . . . In addition to my travel sketch-kit follow-up post, in which I review the items I used most and which could have stayed home, there’s one more post I like to follow every major travel opportunity with, especially when it includes a symposium: Things I learned. 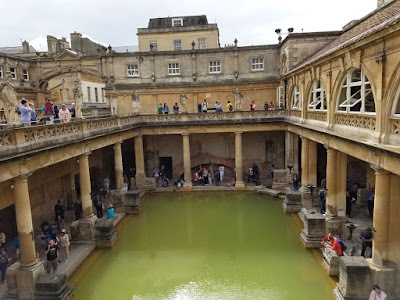 After Barcelona I divided my learnings into two posts: things I gleaned from the symposium itself, and insights about how to prep for symposiums in general (I just reread that one for the first time since I wrote it, and I’m pleased that my advice then still holds up). After Paraty I also talked about the symposium activities as well as workshops. 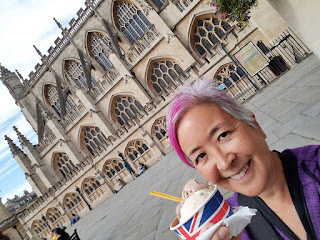 Although it’s been a week since I’ve returned from the UK and had time to think about my experiences there, I still haven’t fully processed what I’ve learned. I’m not sure I can articulate all my thoughts and feelings, but I’ll just begin and see where this post lands me. Some things I learned were about my own process, tools and materials. 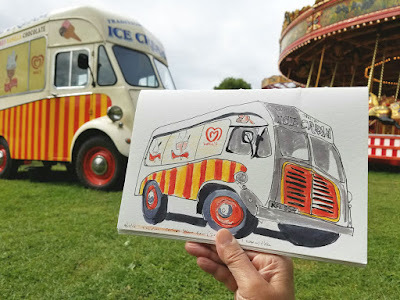 While taking workshops at previous symposiums taught me specific techniques and approaches that I could then apply to my sketching practice when I returned home, my experience in Manchester was entirely different, of course. As a correspondent, whatever I learned had to come from myself on the fly. Because speed was so important, I had to abandon all temptation of detail, and the best way I knew to do that was to rely on brush pens. I brought several, and the two I used most were my favorite Kuretake (No. 13) hairy brush pen filled with Platinum Carbon Black ink and a waterproof Deleter Neopiko Line 3 non-hairy brush pen. Both served me well in different ways – the non-hairy Deleter providing a harder, marker-like line, and the hairy Kuretake providing a more freeform, organic line. With these types of brush pens in hand, I can’t really hesitate or waffle, and I finish quickly, whether I’m ready to or not. same brush pen to make this sketch in Bath. 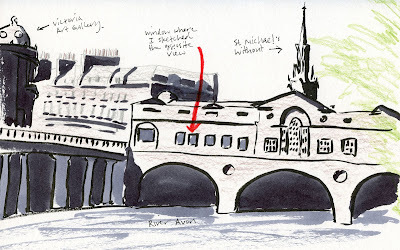 I found that using brush pens so often in the course of three-and-a-half days gave me the confidence to use them the rest of my time in the UK, too. I started learning last November in Japan that I enjoy making challenging architectural sketches more when I used a brush pen instead of a fine point. I’m still finding that to be true, and I’m gaining more agility as I use brush pens more frequently. Other learnings were more about the symposium experience itself. 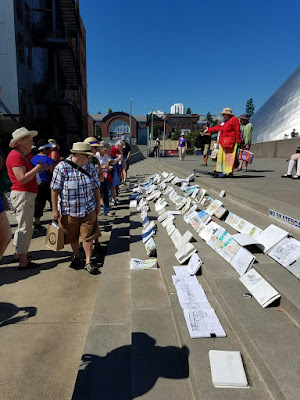 As was the case at previous symposiums, I learned that many attendees did not have a local Urban Sketchers group at home. In many cases, participating in the international symposium was their first experience sketching with other people. Once again, I felt grateful for my own Urban Sketchers Seattle group and how easy it is for me to sketch with like-minded friends whenever I want to; we have outings nearly every week. 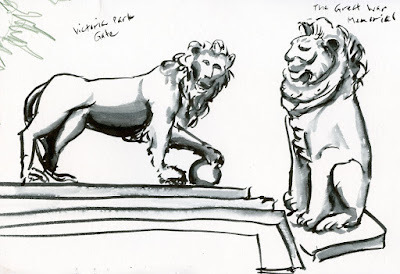 If I drive a bit further south and include opportunities with USk Tacoma, I can sketch with a group more than weekly! 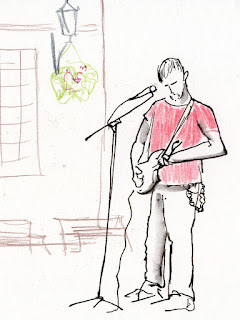 Some attendees I talked to were amazed to hear that, and I don’t take my USk friends and our outings for granted. 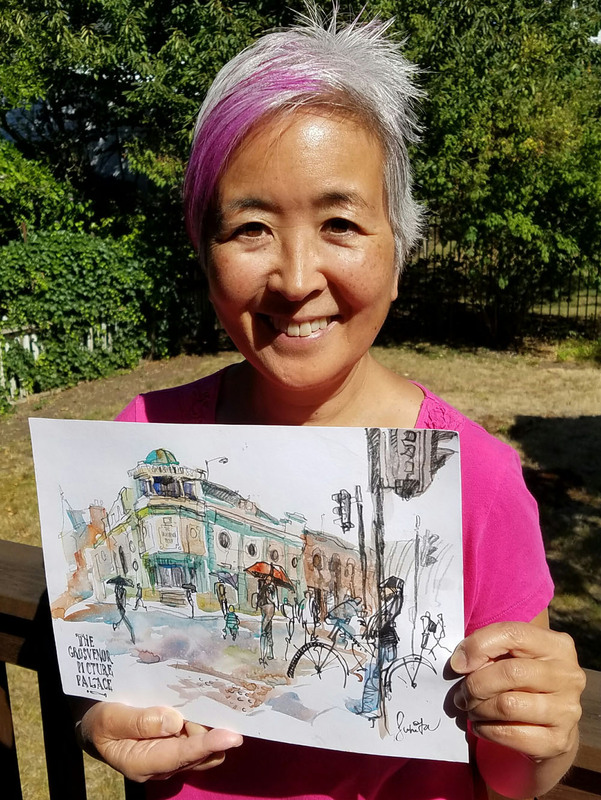 I am immensely grateful to Urban Sketchers for having given me the opportunity to be a correspondent this year. While in Barcelona and Paraty I had the benefit of my specific workshop exercises and the instructors’ particular approaches, this year I had a much greater appreciation for the larger symposium experience. Every time I visited a workshop or other activity to report on it, I saw so much energy and commitment – from the instructors as well as the students. That level of passion is inspiring and invigorating to witness. I felt a greater commitment to my own task because I wanted to share what I saw. 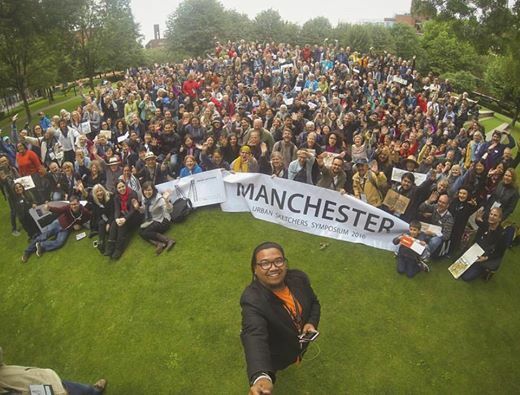 The whole Urban Sketchers "tribe," 500+ strong, in Manchester! It was incredibly rewarding to “be among my tribe,” so to speak, in Manchester. There’s something very special about walking down a street and seeing sketchers literally everywhere you turn. 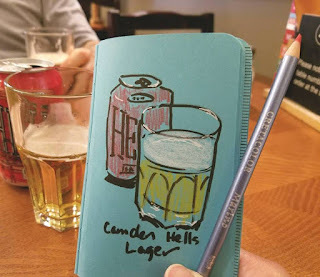 In an international setting, even when language might be a barrier in other circumstances, carrying a sketchbook makes language mostly unnecessary. You just open your book and share. Time and time again, I was moved by this experience. Meeting sketchers whose work I have long admired online is always special. So is becoming reacquainted with people I met at previous symposiums. I can’t say this with enough emphasis: While workshops and activities may be the attraction of symposiums, the real value is the face-to-face experience with people. In Paraty I participated in the annual silent auction at the closing reception by placing a winning bid for Joao Catarino’s gorgeous watercolor sketch (you can see it in this post). I decided early on that I would give back a little to Urban Sketchers this time by donating a sketch to the auction in Manchester myself. 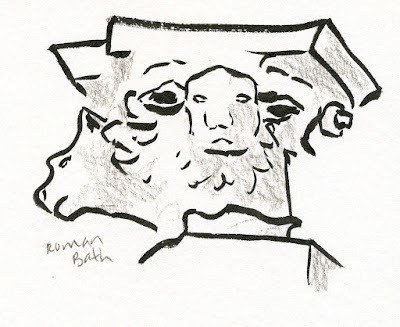 I was concerned that none of my necessarily hastily made sketches would be worthy of the auction, and ultimately none of my results were the kind of sketches anyone (not even I!) would frame and hang on a wall. But as I flipped through my sketchbook looking for potential donation candidates, I was surprised by how difficult it was to consider giving them away. Even sketches that were not in any way beautiful still meant something to me – and I knew they meant much more to me than they ever would to someone else. 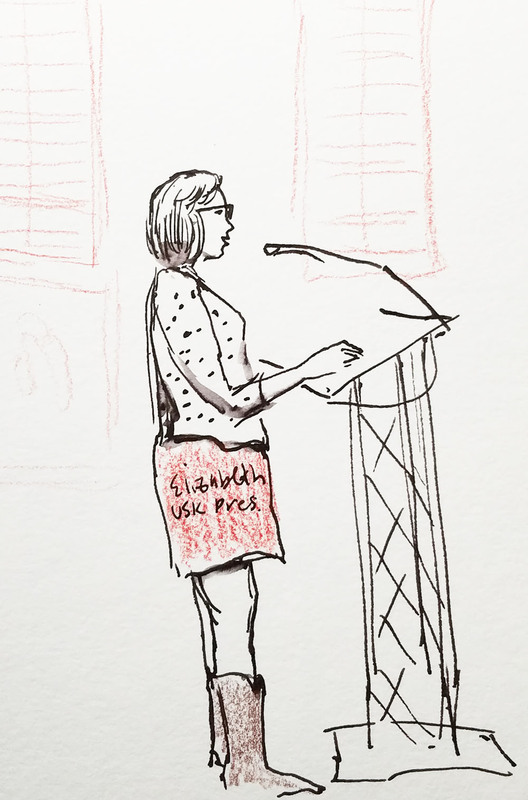 Ultimately I decided to donate a sketch I made of President Elizabeth Alley addressing the crowd during the opening reception. But I admit I influenced its purchase before making the commitment! I showed Elizabeth the sketch, still in my sketchbook, and said, “If I donate this to the auction, will you bid on it?” She said of course she would, so I finally tore it out! What I’m leading up to is that at the silent auction, after some rather competitive bidding, I made the successful bid for a sketch by Suhita Shirodkar. Because of my own experience donating a sketch, I appreciate even more that I was able to take home Suhita’s lively, beautiful work and that she was willing to part with it. Even if I make a sketch with the full intention of selling or giving it away, it’s not easy, because it’s so full of my energy and spirit of the moment. Finally, this isn’t a learning, but I forgot to include it in my first post about the symposium. It’s a link to Parka’s video in which he interviews me about being a correspondent. (I love having my 90 seconds of fame! ☺) In fact, if you want a glimpse of the symposium experience, Parka’s daily video coverage is a great way to get it! 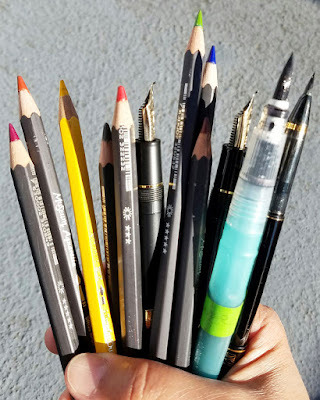 Most-often used items in my sketch kit. Thank goodness I brought my waterproof Rickshaw Bagworks bag instead of my usual purple one. ‘Nuff said. Of no surprise at all was the fact that the things I used daily were the ones I also use most regularly when I’m not traveling: my Sailor fude fountain pens; a Kuretake brush pen; a waterbrush filled with gray ink; and about eight basic colored pencils. 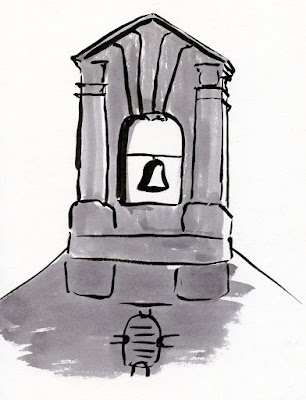 As usual, I brought a few ink refill cartridges just in case I ran out of ink – but I didn’t (one fountain pen and the brush pen came close to running dry, though). However, they take up little space in my bag and weigh nothing, so I suppose there’s no harm in packing them for peace of mind. The bag dump photo shows four fountain pens; I actually took one out at the last minute, but even that third one never got used (at least for sketching; I did use it for journal writing, however, so it still earned its keep). 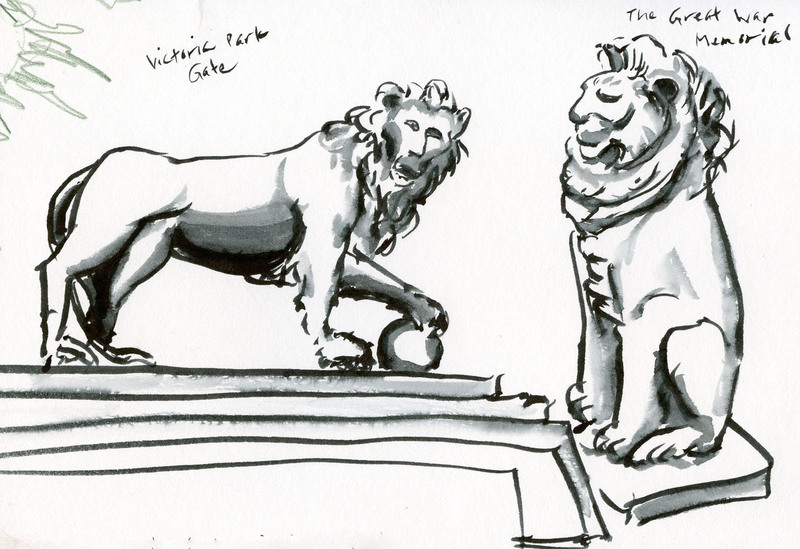 Two are all I ever need – one with waterproof ink; one with water-soluble ink. Although I didn’t use Zig markers often, when I did, they were super-handy for making bright spots of color very quickly. They earned their keep in my bag several times. The thing I hardly ever used surprised me somewhat: my watercolor box. 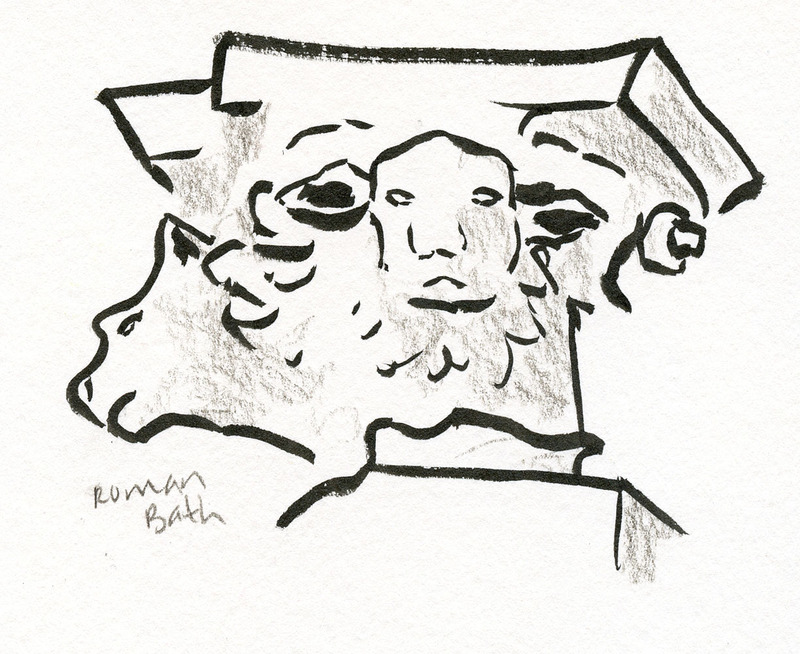 While sketching at the symposium, I learned immediately that I had to keep things as simple as possible. 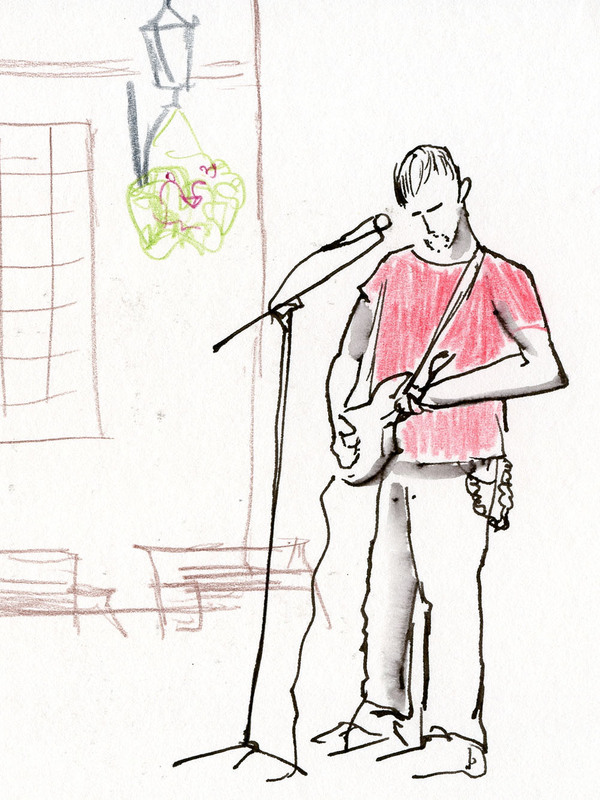 Most of my sketches were done while standing on drizzly and sometimes very windy sidewalks under tight time constraints. 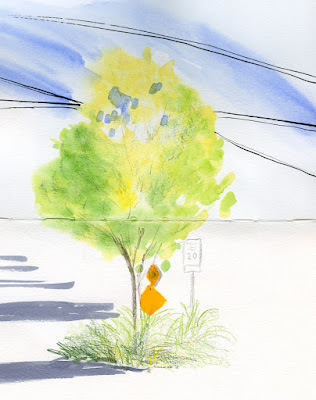 Although I know many sketchers use watercolors under these conditions (check out Kumi Matsukawa’s symposium posts in which she uses watercolors beautifully with the same constraints), I just find it easier and simpler to grab pencils or markers for spots of color. Even when I had more time after the symposium, I still tended to use the same simple materials. I guess that’s not really a surprise – I’ve been leaning away from watercolors for a while now. But. . . Despite the little I used watercolors, I still can’t leave them out entirely. 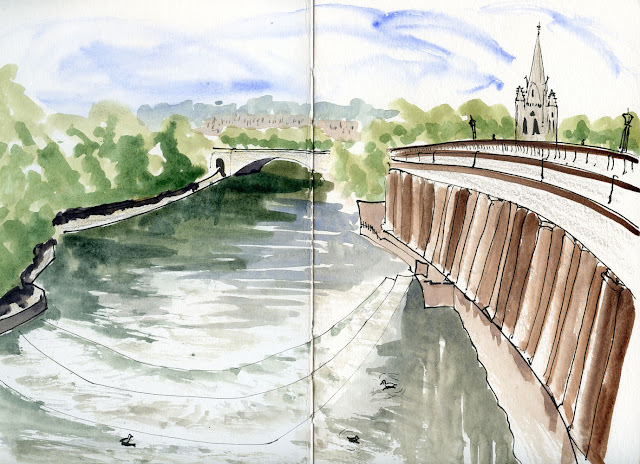 A few times in Wales and Bath, I had the time and stable conditions to make more leisurely sketches that deserved watercolors, and I was very happy I had them. 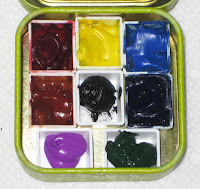 Again, my Trader Joe’s mint tin of paints takes up very little space; I may as well have it. paper is pale enough that I could even use colored pencils on it. 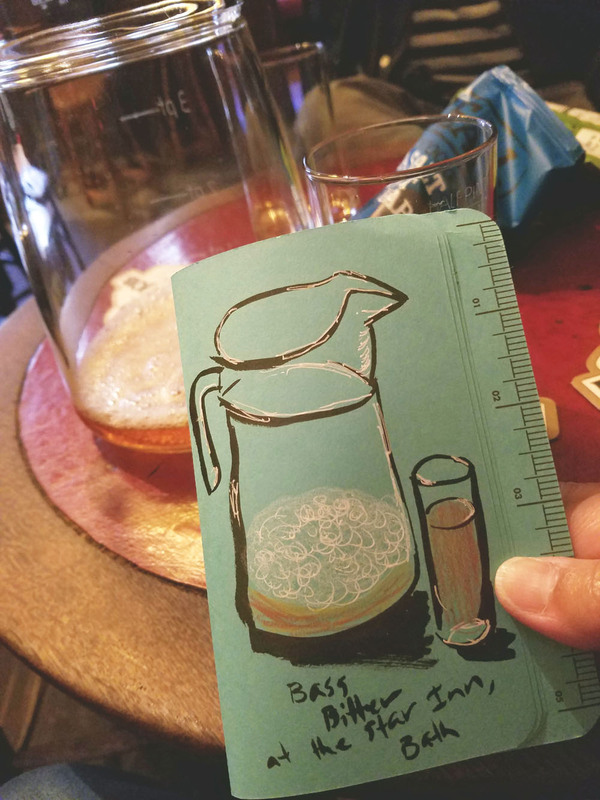 A few other daily users were the pens I like to use specifically in colored Field Notes notebooks (more on that shortly) – a non-hairy brush pen and a white gel pen. Since I brought a light blue notebook instead of my usual red, I was even able to use colored pencils occasionally (when I wanted to enhance the brew effect ☺). Several colored pencils that I had chosen specifically for the trip (based on Google images of the places I would visit) turned out to be less than useful. 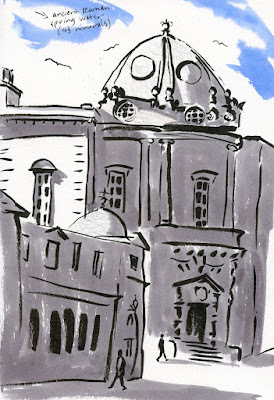 The particularly warm tan of all the buildings in Bath eluded me – I didn’t have that pencil with me at all! But my shortage forced me to mix a close color with what I had, so it wasn’t really a problem. 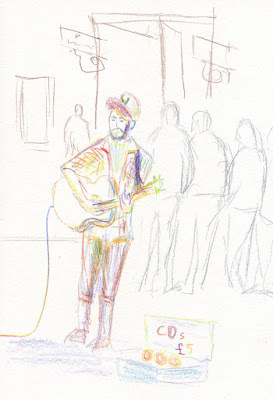 Ultimately I brought too many colored pencils – or not the right ones. 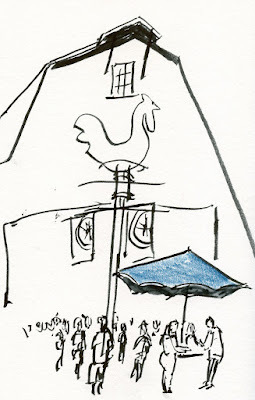 I donated to the USk auction. I relied on the waterbrush filled with sky-blue Iroshizuku Tsuyu-kusa ink frequently when I wanted a streak to simply represent the (rarely) clear sky. The one with Chiku-rin, which I use for splashes of foliage, will probably be taken out of my bag permanently. 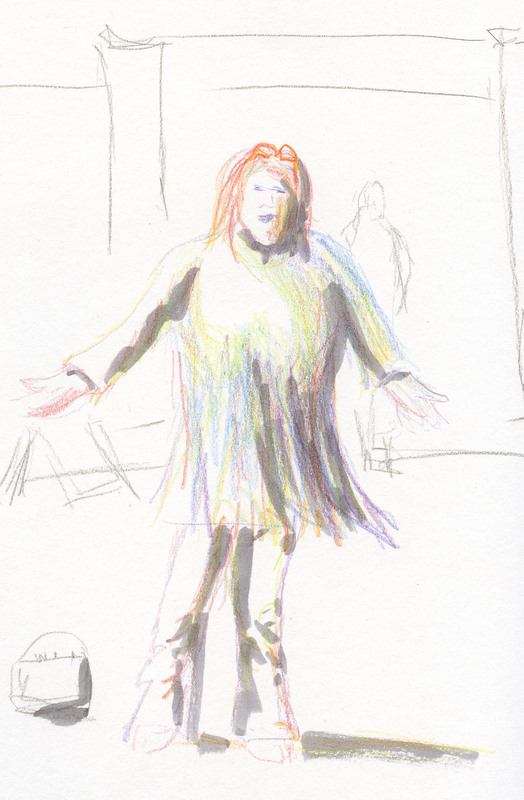 More and more, a lower-maintenance colored pencil does the same job. The Stillman & Birn spiral-bound hardcover Beta sketchbook in the 10-by-7 size that I had gotten specifically for the symposium worked perfectly as intended. The hardcover back gave me a stable base for sketching while standing, and the size was ideal, too. I sketched on only one side of each page until I filled the book, then I started working on the back sides of a few. My intention was to donate at least one sketch to the auction, which I did, and the spiral binding made it easy to remove. The book was an excellent solution for that specific need. As for the rest of my sketches? I was as happy as I always am with my hand-stitched signatures, and I look forward to binding them into a cohesive single volume from the trip. I filled only five of the seven signatures I’d prepared, however (I forgot to account for all the sketches that would go into the S&B during the symposium). 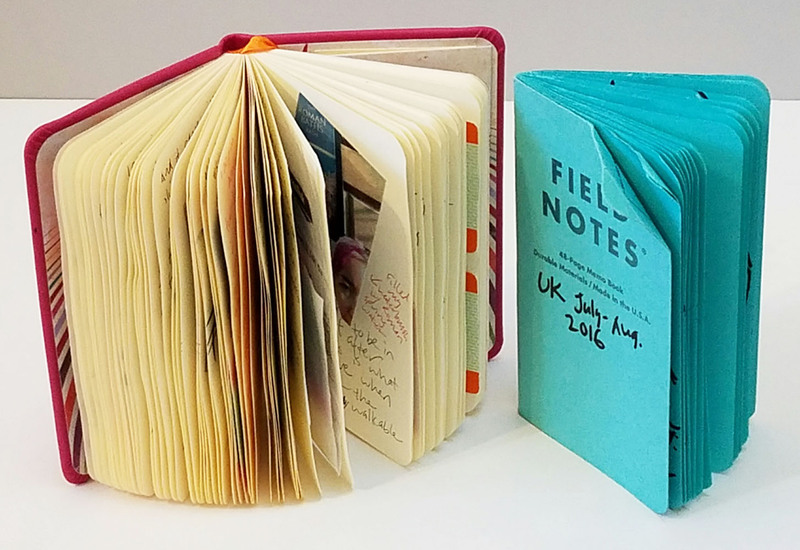 Left: Rhodia Rhodiarama notebook nearly full of journaling, photos, ephemera. Perhaps the biggest surprise of all was how I used my Rhodia journal in relation to a blue Field Notes notebook (that I almost didn’t bring). For the past three years, I’ve been happily using a pocket-size Rhodia Rhodiarama notebook as my travel journal (nearly filling one on each trip). Small enough to fit in any bag or pocket, it has paper that takes fountain pen beautifully with sizing that allows the ink to wash nicely. It’s been a great catch-all book for travel musings and memos, ephemeral collage and small sketches made in trains and cafés. But the past several months I’ve been having so much fun filling red Field Notes notebooks with exactly the kind of sketches I’m likely to put into the Rhodia that at the last minute I decided to take a blue one along to the UK (I still prefer red for the way it makes highlights pop, but it was fun having a different color while traveling). I feared the two notebooks would be redundant, and I’d waste time waffling over which notebook to sketch in. As it turned out, I hardly sketched in the Rhodia at all because I’ve grown so fond of the brush-pen-and-white-gel-pen combo that goes so well with colored paper. 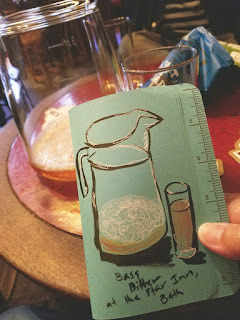 I completely filled the Field Notes with random chimney pots in Wales, heads in trains and planes, and all the brews I sampled throughout the UK. As for the Rhodia journal, it wasn’t wasted or redundant, either. Although I didn’t sketch in it, each evening as I relaxed in our hotel room, I’d pick out just two or three of my favorite photos of the day and print them with my Polaroid Zip printer. The self-adhesive ZINK paper made it easy to put them into the journal, and the sheets are exactly the right size. Filled with those photos as well as ticket stubs and other ephemera to accompany my notes and thoughts, the 192-page book came home with only a dozen or so empty pages. Although I would have preferred to keep doodly sketches in the same book as the writing, I’m happy that each book filled different needs without redundancy or waste. I’ve decided to make a colored Field Notes a regular part of my travel bag – just as it is now a regular part of my day-to-day bag. 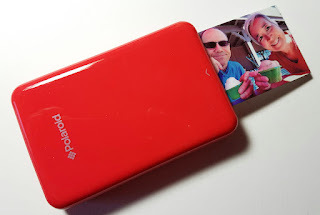 I know I’ve said this before, but each time I come back from traveling, I learn the same lesson: The things I take with me when I travel should be the same things I use every day here at home. The bag I carry to Wales can contain exactly the same things it contains when I walk to Maple Leaf Park. Whenever I think I need something “special” or additional, I end up bringing it home unused. (Future self, please take note and remember this!) Overall, however, I’m pleased that my kit served me well with no serious regrets. Finally, here’s a photo of the swag bag I received at the Manchester symposium! I appreciate the months of work the symposium team went through to acquire all the goodies from sponsors. (The photo also includes some cards I exchanged with other participants.) I’ve already enjoyed trying some of the Cretacolor pencils, especially a water-soluble graphite that I used on my first sketches back home in Seattle last week. 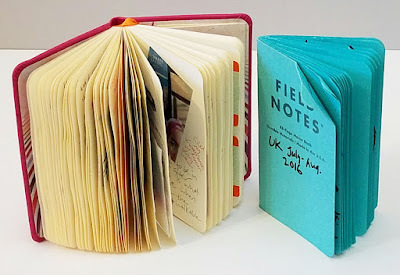 The Leuchtturm 1917 sketchbook also looks interesting. (They come in a variety of colors, and I managed to snag a bright pink one!) 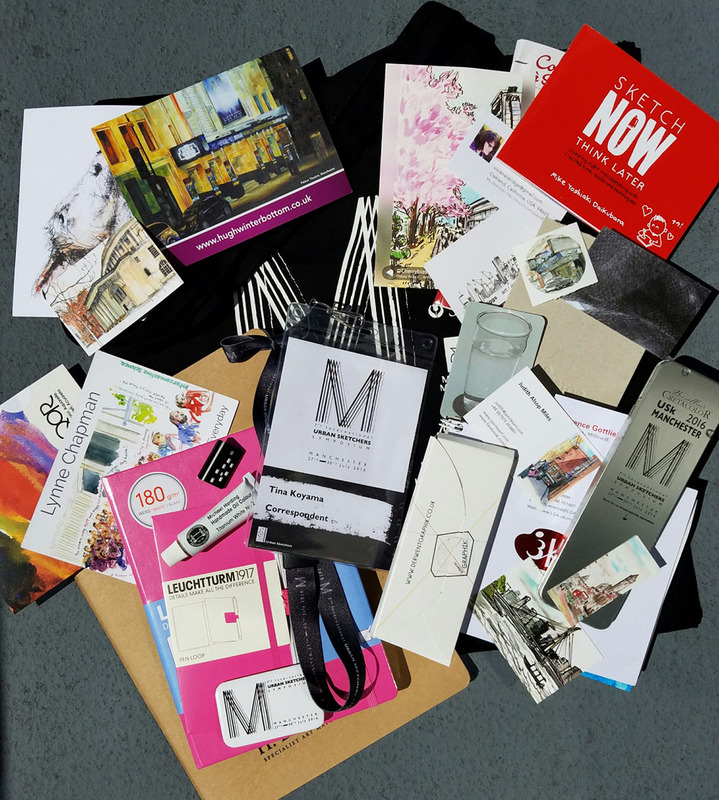 As a keepsake, though, nothing makes me happier than the symposium-logo tote bag that all the swag came in. I’ve used and abused my Barcelona and Paraty symposium totes for years, and I look forward to doing the same to my Manchester bag. Swag from the Manchester symposium! 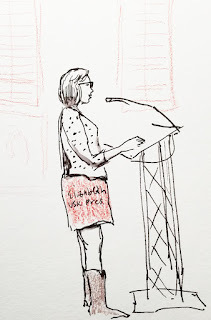 Certainly the Manchester symposium and the substantial demands of being a correspondent gave me the greatest opportunity to grow as an urban sketcher. 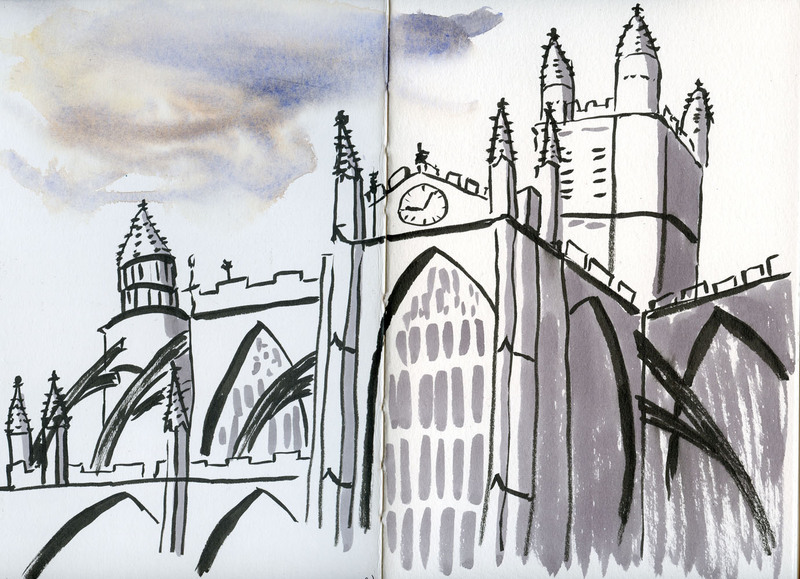 And the castles of Wales were impossible to beat in terms of sheer visual spectacle – and therefore challenging sketching! 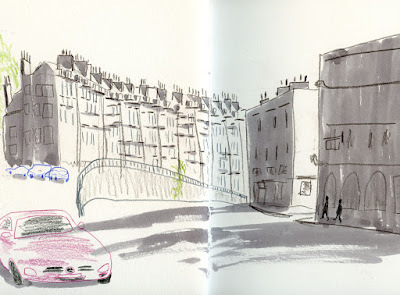 But if I had to choose, I’d say that the most sketching fun I had during our whole trip to the UK was in Bath. With none of the rain frustrations of Manchester and Wales, and without London’s oppressive noise and crowds, Bath was a wonderland of sketchable ancient structures and beautiful architecture. Although it turned out that I hadn’t brought the right tones of warm tan colored pencils for the amazingly consistent buildings (the photos I studied online made them look cooler and darker), I was challenged to come up with the right mix myself. A bonus was being able to fill a waterbrush with ancient Roman spring water (after taking a sample sip, of course – yuck!) and then sketch with it afterwards! I love imbedding the “DNA” of a place in a sketch that way. It was a pleasure to meet Ian Hedley and his family! 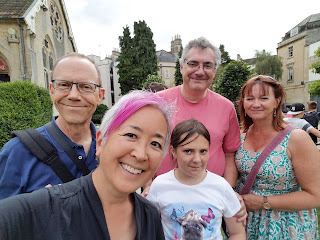 Two highlights of our visit to Bath were meeting up with other sketchers. The first was Ian Hedley, whose blog, Pens! Paper! Pencils!, has been one of my favorites for a long time. (I was thrilled when he invited me to write a guest post about urban sketching a few months ago.) When he heard we were going to be in Bath, he and his family, who live in a nearby town, came over on the train to meet us. It’s always a joy to finally meet people in person after conversing with them online. 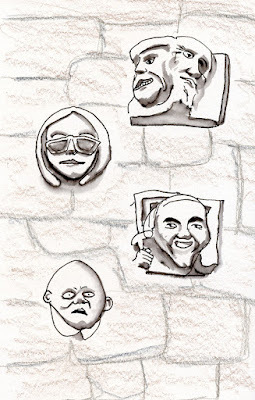 The next day we met up with Ed Harker, another sketcher I’ve gotten to know through his blog the past few years. Keeping up with Mostly Drawing, I learned that Ed has been sketching about as long as I have, and what’s more, he has made it his practice to sketch every day. I admire his commitment to drawing, and I appreciate his sense of humor. It was a pleasure to finally meet him at the symposium, where he gave a lively presentation and a demo. A long-time resident of Bath, he showed us around his charming town in a way that only a local could. I specifically asked him to show us the Bath that we wouldn’t see from one of the tour buses lumbering through the narrow streets, and he certainly came through – by taking us to the Carter’s Steam Fair! 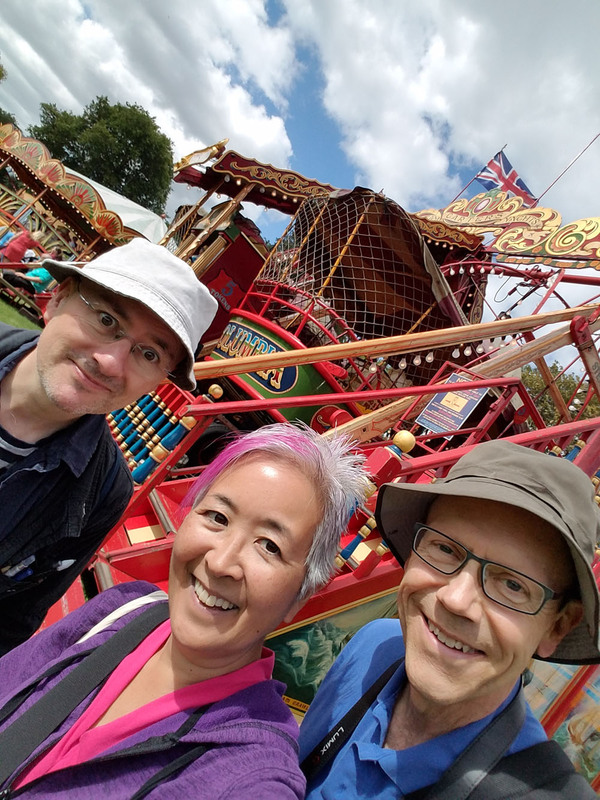 A delightful collection of vintage steam-operated rides and old-time attractions, Carter’s comes to town only for a week or so each year, and we happened to be there at just the right time. 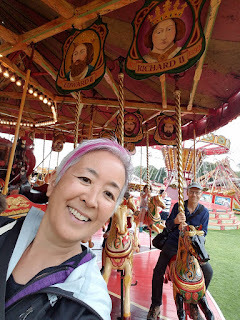 Greg and I loved it so much that we went back again the next day (and rode the “gallopers”)! Ed took us around to see the quirky backsides of old buildings (as well as the beautiful fronts). We also thoroughly enjoyed having local bitters with Ed at his favorite pub and strolling through the streets I’ve seen him sketch. Bath must be a pleasant place to live because that’s where we encountered some of the friendliest and most helpful people. If we stood on a street corner, map in hand, looking perplexed, within moments someone would come to our aid and offer directions or answer our questions. 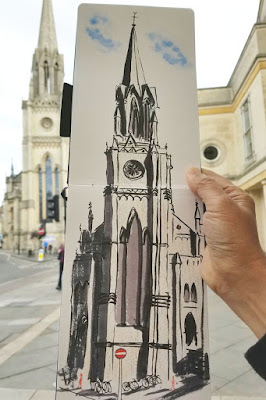 Every way I turned in Bath was a visual delight – stunning architecture, narrow, curved streets, strange faces carved into stone walls – that was challenging to sketch but not daunting. Our days in Bath were the only time on this trip that I felt I could sketch in the way that I enjoy most: Meandering through a place without an itinerary and being able to stop and sketch whatever I discover. Now that Greg and I have done some traveling, I’ve come to learn that I’m happiest when we can build in time – especially toward the end of a trip – for that kind of agenda-free meandering. When travel planning, we always start out with a (probably common) compulsion to consult with the Rick Steves checklist, talk to friends who have visited the same places and try to see and do as much as possible. But when I read through my journals afterwards and thumb through my sketchbooks, I know that we’re both happiest when we ignore the checklist and simply explore. 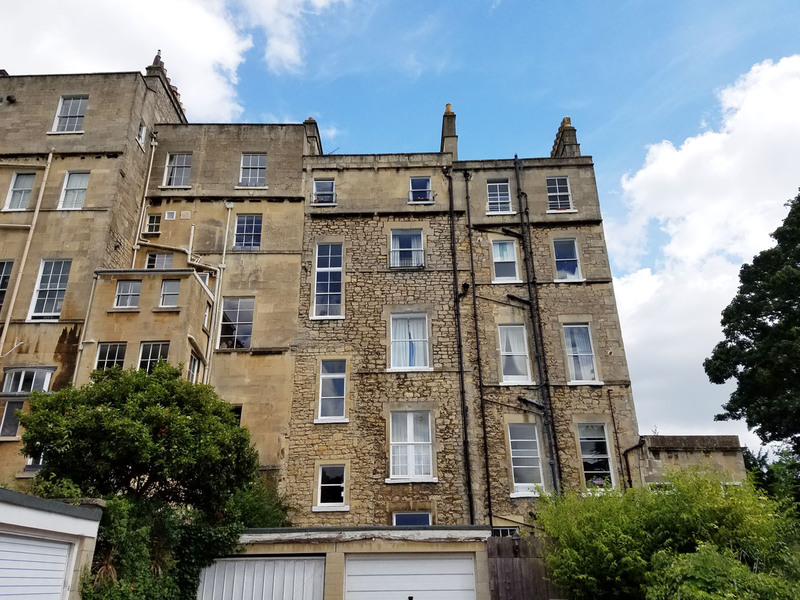 We couldn’t have picked a better location for that kind of exploration than Bath. 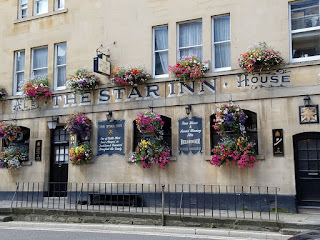 Filled with charm around every corner, very walkable Bath made me feel safe and comfortable on my own (Greg likes to go off by himself with his camera just as I like to go off for a sketch). 8/10/16 Ice cream vending truck at Carter's Steam Fair. . .
. . . and of course the ice cream that came from it! 8/10/16 One of Bath's many curved streets. 8/8/16 Inside the Roman Baths, where tourists listen to an audio guide. 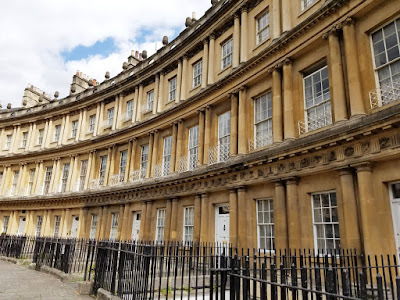 The front of the elegant and stately Royal Crescent. . .
. . . and the slightly less elegant backside. 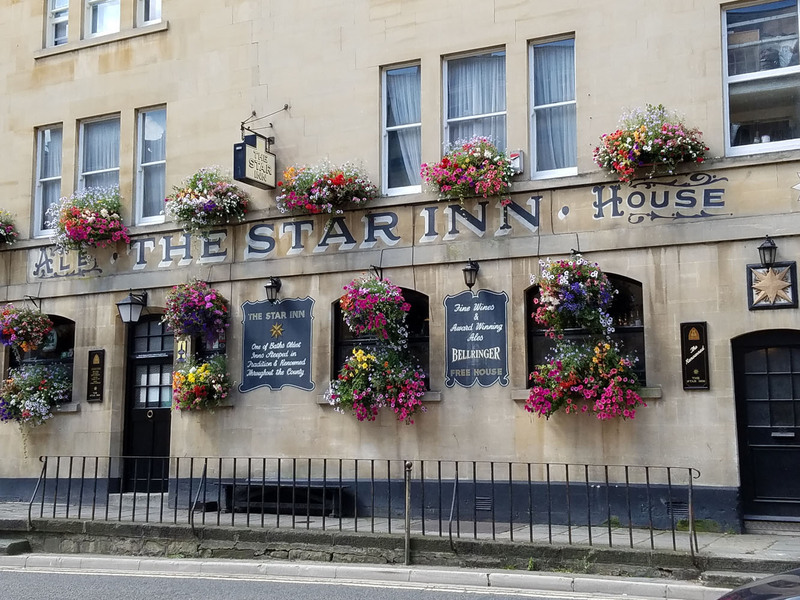 Ed's favorite pub. . .
and the Bass bitters we drank there. 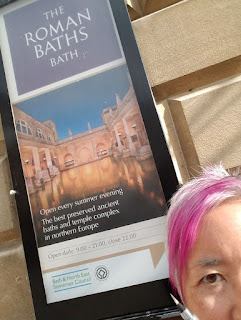 Farewell Bath and all of the United Kingdom! We'll be back for sure!